Transparency is important when creating cursors. It permits to display a cursor over a background image without fully hiding it. Parts of the background image are visible through the transparent areas of the cursor. Transparency can be total (1-bit mask, in GIF for example) or partial (8-bit mask, a.k.a Alpha Channel, in PNG or JPEG2000 for example). Partial transparency (RGB/Alpha Channel) produces better results when displaying cursors. See What is a Cursor for more info. The following image formats support transparency: Photoshop® PSD, PNG, RGB, JPEG 2000 and WMF. GIF support only total transparency. Axialis CursorWorkshop permits to convert images to 32 BPP (RGB/Alpha Channel) which is much more convenient to create cursors. Windows® and animated cursors support RGB/A images. These cursors can be displayed in Windows®XP, Windows Vista™ or more. Older systems does not support RGB/A cursors. That's the reason why you need to include other standard formats in your cursors. 1. Open your image in CursorWorkshop. Choose the "Create Transparent Areas" Mode: or press "T". Click in the areas where you want to create transparency. 4. For example, the illustration below shows the image "Cursors\Tutorials\Arrow Add - Opaque.png". 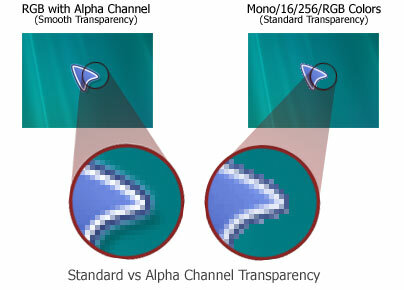 It is an RGB file without alpha channel, so it does not contains transparency. The background is white ( ) and fully opaque. If you create a cursor from this image, it will create a white square around the final cursor, which is not the result we expect.